The Great Northern War was an important turning point in Russian history. While many do not consider it a very seminal or nexus point in the country’s history, I am of a very different opinion. If just a few things go wrong for Peter the Great, Russia would have been a whole different country today. Sweden in the late-1600’s and early 1700’s was one of the most powerful countries militarily in all of Europe. After Peter I took control of the Russian throne in 1689, he decided that the Russian army needed serious upgrading and westernization. He understood that there were many enemies out there who would love to take control of the vast resources found in Russia. Many in Europe viewed the country as a backwater Oriental weakling. Peter saw this and made preparations for war which was to be part of Russian life for almost his entire reign. The Great Northern War saw its beginnings in 1700 with the alliance of Denmark–Norway, Saxony and Russia. They were up against the young Charles XII of Sweden and his allies which included the Ottoman Empire, Holstein–Gottorp, Polish–Lithuanian Commonwealth and with some back and forth allegiance, the Cossack Hetmanate. Early on in the war, the Russian’s and their allies underestimated Charles who was a mere 18 years of age when the Great Northern War began. He crushed the Danes and Norwegians along with Saxony early on leaving only Russia left to defeat. When he started his war with Russia, Charles XII had already given Peter I a crushing defeat at the First Battle of Narva. Luckily for Peter, Charles decided against pressing on instead heading south to knock out Poland. Peter now had time to regroup and rebuild his army. He learned from his prior mistakes and made sure he would never let Charles beat him like that again. At home, Peter I was deeply unpopular among the conservatives throughout the country. From the boyar class down to the lowly peasant, his westernization program was met with disdain and hatred. In 1707, it reached a boiling point with the Bulavin Rebellion (which will have a podcast episode coming up on September 8th, 2013). With Peter off fighting with Charles XII in the Great Northern War, the rebellion was difficult to control. It is here we come up with a nexus moment that is found throughout history. 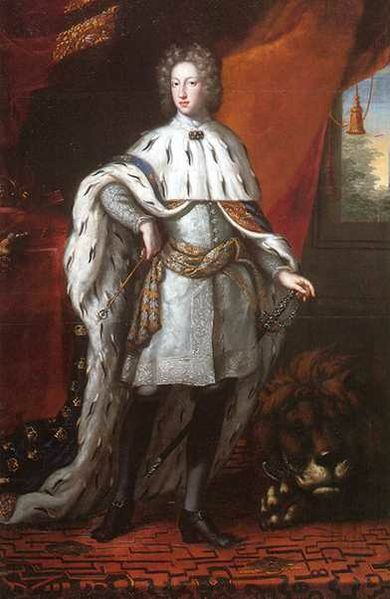 Charles had begun his invasion of Russia with a goal of taking Moscow in 1707. Strangely enough, Bulavin never made a connection with Charles and his invading army or the Ottoman Empire which would have loved to get back at Peter. There is very strong evidence that had these groups hooked up, Peter would have been in deep trouble. The big seminal moment of course comes during the Battle of Poltava in 1709. Had Peter lost this battle, his hold on Russia would have been very tenuous. The Great Northern War became a win for Peter and allowed him to deal with internal issues. Unfortunately for the peasant class, the way Peter dealt with things was to become more oppressive. The Time of Troubles, it could be argued, could be listed as the greatest threat to Russia’s existence but as for important events, I have it ranked only number twelve for a number of reasons. Granted, it was a troublesome time to be a Russian with the great famine killing one-third the populace of the country. It also saw the Bolotnikov Rebellion, which showed the great rift between the haves and the have-nots. And of course, its end gave us the first in a long line of Romanov Tsars. When looking back at the Time of Troubles, you see a number of events within its time frame of that influenced the future of Russia. One of the most important ones is the edict by Tsar Vasily Shuisky to lengthen the time that serfs could be hunted down and returned to their masters from 5 years to 15. That would expand during later rulers but it set the precedent and locked the serfs down in no uncertain terms. The Time of Troubles also marks the end of the Rurik Dynasty with the death of Tsar Feodor, son of Ivan the Terrible. The Rurik Dynasty had lasted from 862 – 1598, a period of over 700 years. Had Ivan not killed his more able bodied son Ivan Ivanovich, it may have lasted much longer and may not have had to suffer through the Time of Troubles. 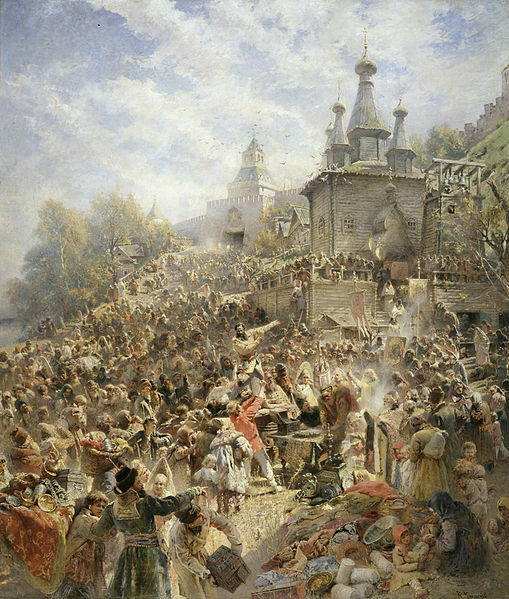 It also marked one of the high points in Russian unity and pride, especially after the expulsion of the Poles from Moscow in 1612 under the leadership of Kuzma Minin, a Nizhny Novgorod merchant, and Prince Pozharsky. The groundswell of support was crucial in the survival of the country and had it not happened, we likely would not know the country of Russia as we know it. While it is a critical time in Russian history, it ranks far below some of the others that I will be addressing in the coming weeks.